Last week at the Reuters Media Summit someone asked EA’s CEO John Riccitiello his thoughts about M&A prospects for the gaming industry moving forward. It was a fair question, as head of EA he’s a qualified expert on the gaming industry, as a former partner at private equity firm Elevation Partners, he’s well educated and informed about M&A mechanics. Part of John’s measured answer was “Is it ripe (for mergers), or has it already been picked? I would argue that it’s been largely picked." Those remarks underscore just how surprising Sunday’s announcement that Activision and Vivendi Games intend to merge was. When the two companies said they’d merge to form an $18.9b company, a gaming company with a market cap even bigger than EA (approx. $17.4b) some jaws were definitely hanging slack. This morning, Vivendi and Activision provided more details which opened a window on the structure and presumed opportunity. Structurally, Vivendi will pay $1.7b in cash and provide their gaming business which includes Blizzard Entertainment, Sierra and Vivendi Games mobile. These assets will be spun into a new company, also containing Activision, to be called Activision Blizzard. Vivendi will retain a 52% majority stake. Activision CEO Robert Kotick will be President and CEO of the new venture. Bruce Hack , CEO at Vivendi Games, will be Vice Chairman and Chief Corporate Officer. Strategically, the deal seems to revolve around a handful of elements. Portfolio diversification, or complimentary assets is a key one. Ambitions for Asian markets and online opportunities may be others. The gaming industry is not unlike Hollywood or Venture Capital. In all three industries time and money limit the number of productions or investments that can be done per year. There’s always a likelihood some will fail. To offset that, at least a few need to outperform the rest to compensate. In gaming, expense and time are huge factors. It can take as long as a few years to complete a full title. And with multiple platforms to develop for, and expensive marketing, it can be incredibly costly. One way to manage the risks of the end product being a failure, like investing, is diversification; to focus on range of titles, both in platform and concept. Joining Vivendi Games and Activision together will create one of the most diversified portfolios in the industry. In concept, they’ll compete in most genres from sports, to action, to MMORPG’s to music simulation. In platform, Activision Blizzard will also be well balanced between console and PC/online gaming. The two companies have track records that are more complimentary than competitive. 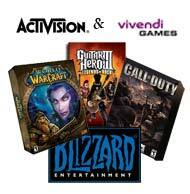 With games like World of Warcraft and Diablo, Vivendi’s Blizzard has sold more than 56m PC game units since 1995. They are responsible for 4 out 5 all time best selling PC games. Activision, in turn, is a console company first and foremost. They make leading titles for the Playstation, Xbox and Wii; games like Guitar Hero and Call of Duty. Taken together, the two companies also marry complimentary revenue models. As an online game, Blizzard (which is about 2/3rds of Vivendi Games Revenue) earns much of its income from recurring, predictable monthly subscription fees. And even while costly to run (they have spent more than $200m in content and infrastructure development and keep 2000 support staff in global support), Blizzard’s also incredibly lucrative. Estimated 2007 earnings are for operating income fo $517m on revenue of $1.1b. Margins are above 40%. Activision relies primarily on retail sales to provide revenue. That’s a cyclical model that’s not as easy to forecast and with cost of sales higher, lower margin. Estimated 2007 numbers for Activision are $340m in Operating Income on $2.35b in revenue. Asian markets are a second value proposition for this deal. Considered a major growth industry for gaming, most western game developers have struggled to adapt to cultural differences and find success. In the recent past, companies like EA have taken on regional distribution partners to help make a fit. Blizzard’s World of Warcarft is an exception. The title is the “leading western entertainment franchise in Asia.” As a company, Blizzard brings expertise and skills that could be influential in helping Activision learn how to increase sell through for their console offerings. Online gaming can be both incredibly appealing and tremendously troubling from an investment perspective. Their largely subscription based business models mean a company has a constant, recurring income as opposed to a one time payment. That’s everyones dream; the abilitiy for your titles to continually make money. And a projected $13b 2011 market opportunity isn’t bad either. On the downside, building and maintaining a live “online” experience is costly. Startups entering the space are drawing considerable funding, but they need it to survive. Blizzard is unrivaled in their history of successfully balancing those concerns. World of Warcraft, their leading title, has 9.3m people paying near $15/month to play. The game is constantly upgraded and expanded to keep players interested. 2,000 staff members are globally available 24/7 in support. No company has come close to achieving the same kind of success. Merging with Blizzard and taking cash in the deal ($1.7b) assures they have both the technical and fiscal resources to do just that. As much as the complimentary elements of this deal make it appealing and seemingly a smart fit, there are also pitfalls, notably (assuming the deal goes through) with post merger integration. Both the driving brands, Activision and Blizzard, have focused on different types of gaming and different types of gaming environments. They are prominent players in their respective industries and have established practices for how they go about running their business and developing their products. If the two companies are too aggressive in trying to combine these parts, they stand to risk damaging their current brands and core assets. On the other hand, if they are too cautious and keep the two largely independent (as initially appears to be the goal), they’ll lose some of the financial gains due to management redundancy and struggle to realize gains from truly sharing complimentary intellectual and development capital. Merging multi-bllion dollar companies with different cultures is no small task. World of Warcraft as a console game? Activision creating a MMORPG out of Call of Duty? …such efforts if ever allowed could turn out very good or very very bad. For now, however, they’re not on the radar. How these companies integrate will be as significant a test, if not more so, than coming to terms on the deal in the first place. To close, this deal will need to be approved by a majority of Activision’s shareholders and get regulatory approval. As much as both are probably likely, they’re not a sure thing. Best case, it won’t happen until first or second quarter 2008. By then, more detail on post merger integration may be available. •Games on Fire, How hot is the Gaming Industry?